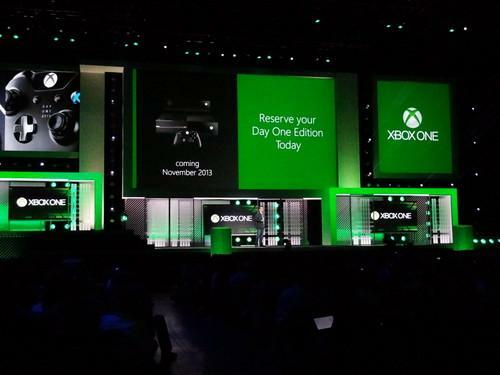 Microsoft's Xbox One game console will go on sale in November for $499. Microsofthas announced that Xbox One will go on sale in 21 markets this November for $US499. The company showed exclusive game titles and highlighted some of the new capabilities of the next generation console at its E3 press briefing in Los Angeles. Xbox One was first shown at Microsoft headquarters in Redmond, Washington, last month, and the E3 presentation was focused on what the company left out then: gaming. Microsoft paraded a number of game developers on stage to show off a few of the 13 exclusive titles that will be available for the console at launch. In one demonstration, while playing "Dead Rising 3" a second gamer used Smart Glass through his smartphone to call in an airstrike on attacking zombies. Smart Glass is Microsoft's second screen technology that it announced last year. It allows gamers to use their smartphones and tablets in tandem with the game on the main screen. It can also be used to deliver second screen content during movies and television shows. "With Smart Glass natively built into Xbox One, many of the actions you can take on your console can now be done directly from any Smart Glass device," said Marc Whitten, corporate vice president of Xbox LIVE at Microsoft. He showed how gamers could see a timeline of their progress or set up and launch a multi player game from a tablet. Microsoft also showed how Smart Glass could be used when developing custom games. Project Spark is Microsoft's game creation program that allows users to build a game landscape, create characters and define behaviors. In a demonstration, voice control through Kinect was used to create a rough landscape, which was then further refined using a tablet running Smart Glass. Xbox One is a follow up to the company's Xbox 360 game console, which launched eight years ago. Microsoft showed off a new design for Xbox 360, which it bills as slimmer and quieter. It goes on sale immediately. Xbox One will include a 500GB hard drive, Blu-ray player, built-in Wi-Fi and a Kinect sensor. It will cost £429 in the U.K. and €499 in European markets. The console is available for preorder now.